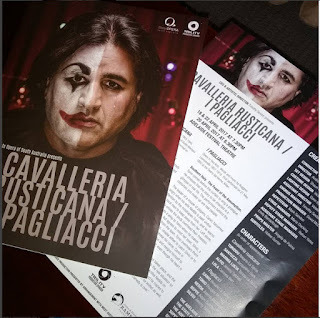 Last night I saw the opera double-bill of Cavalleria Rusticana and I Pagliacci. Although familiar with some of the music, it was my first time seeing these two one-act operas. Overall, it was an enjoyable production; although, I liked I Pagliacci best. Rosario La Spina sang lead tenor in both and was excellent as always; however, my favourite performance of the night came from Jeremy Tatchell. As usual, there were moments when the orchestra overwhelmed the soloists singing lower voice parts, but it wasn't too bad on this occasion and has, I think, more to do with the acoustics where I sit in the grand circle than anything the singers or musicians are doing/not doing. All up, it was a very pleasant evening at the opera and wonderful to finally see a performance of these two classics.